The Sahiwal originated in the dry Punjab region which lies along the Indian-Pakistani border. They were once kept in large herd by professional herdsmen called "Junglies". However with the introduction of irrigation to the region they began to be kept in smaller numbers by the farmers of the region, who used them as draft and dairy animals. 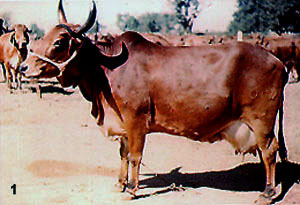 The Sahiwal is one of the best dairy breeds in India and Pakistan. It is tick-resistant, heat-tolerant and noted for its high resistance to parasites, both internal and external. Cows average 2270 kg of milk during a lactation while suckling a calf and much higher milk yields have been recorded. Due to their heat tolerance and high milk production they have been exported to other Asian countries as well as Africa and the Caribbean. As oxen they are generally docile and lethargic, making them more useful for slow work. Their color can range from reddish brown through to the more predominant red, with varying amounts of white on the neck, and the underline. In males the color darkens towards the extremities, such as the head, legs and tails. Sahiwal arrived in Australia via New Guinea in the early 1950’s. In Australia, the Sahiwal was initially selected as a dual-purpose breed. 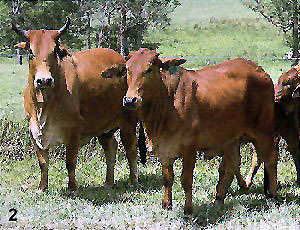 It played a valuable role in the development of the two Australian tropical dairy breeds, the Australian Milking Zebu and the Australian Fresian Sahiwal. Sahiwals are now predominately used in Australia for beef production, as crossing high grade Sahiwal sires with Bos taurus animals produced a carcass of lean quality with desirable fat cover.